Pleurotus are wood-decaying fungi that produce distinctive mushrooms with variably colored caps (brown, gray, whitish), strongly decurrent white gills, rubbery flesh, and white spore deposits. Pleurocybella produces very similar fruitbodies, but they are very thin-fleshed and pale and occur only on conifers. 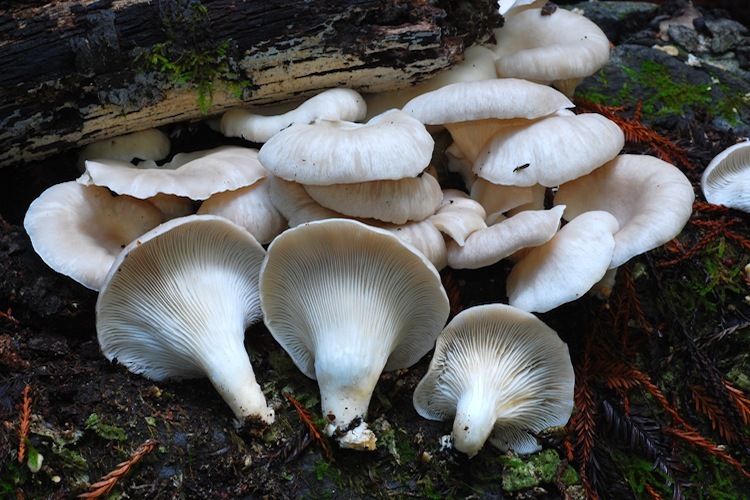 Although they cause a white rot in their host, wood is not their only source of nutrition - recent research shows that Pleurotus trap and digest microscopic nematodes! Members of the genus occur on both hardwoods and conifers, and are common features of urban and forest settings. The highly variable fruitbodies of members of this genus have confounded taxonomic efforts somewhat and it may be that California species are going by misapplied names. Important identification characters include cap color, host tree, and microscopic details.